Hot Marbella Christmas Party starts the Festive Season! 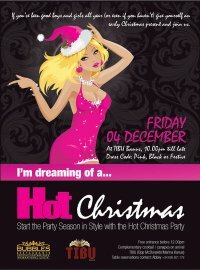 Hot Magazine's Christmas Party promises to kick off the Festive Season with a bang! Hot Marbella Magazine are holding their Christmas Party this Friday, December 5 at TIBU nightclub in Puerto Banus. This is the second party that the coasts most talked about publication has hosted, and follows the great success of the first Hot Magazine party in TIBU in October. "The first party was amazing" said the magazine "And we've had a great response to this one as well, so we're asking everybody to register on www.hotmagazine.es to make sure that they are on the guestlist"
Promises to be the Hottest Party in town! Dusting off my Santa outfit already!